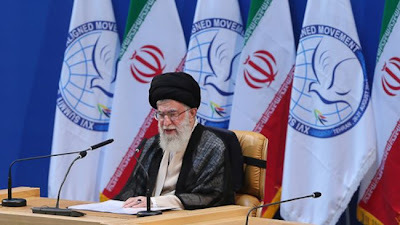 Following is the text of the Leader of the Islamic Revolution Ayatollah Seyyed Ali Khamenei’s inaugural address delivered at the 16th Non-Aligned Movement (NAM) Summit in Tehran on August 30, 2012. 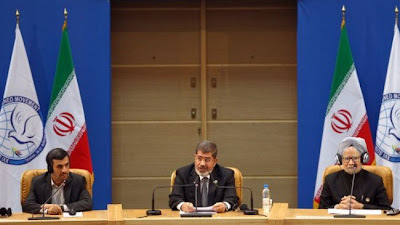 Egypt’s President Mohamed Morsi (Centre) addresses the 16th Summit of the Non-Aligned Movement (NAM) in Tehran on August 30, 2012 along side Dr Manmohan Singh, Indian Prime Minister and Dr. Mahmoud Ahmadinejad, President of the Islamic Republic of Iran. The 16th Summit of the NAM was held during 26-31 August 2012, in Tehran, under the chairmanship of the Islamic Republic of Iran. In 1979, following the Islamic Revolution earlier in the same year, the Islamic Republic of Iran joined the NAM. Iran is currently the Chair of NAM. I congratulate His Excellency Dr. Mahmoud Ahmadinejad, President of the Islamic Republic of Iran, on assuming the Chairmanship of the Non-Aligned Movement. Mr. Chairman, India will extend its full cooperation to Iran as it leads the Movement over the next three years. I also express my appreciation to Egypt for its stewardship of the Movement since the last Summit, even though Egypt has been in the midst of profound domestic change. Mr. Chairman, the Non-Aligned Movement, representing the large majority of humankind, has been a powerful force for the promotion of global peace, security and development. Our shared objectives of working together to preserve our strategic space, ensure our social and economic development and strive for a more just and equitable world order remain as true and relevant today as they were in the past.